Modern technology allows homeowners to buy various appliances to make healthy juices from fruits and vegetables, prepare soft food for the baby, to make frozen desserts and grind coffee beans. Having a separate appliance for each function can be a very expensive proposition, and it can lead to an extremely cluttered kitchen. 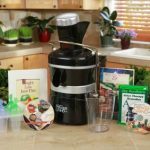 With the Omega J8005 Nutrition Center Single-Gear Commercial Masticating Juicer, budget and clutter problems can be avoided. 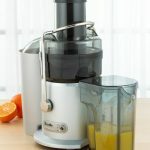 We’ll begin this Omega J8005 Commercial Masticating Juicer Review with it’s features. The dual system (the first stage crushes the produce, while the second stage squeezes the pulp before it is ejected) operates at a low rpm speed. It provides a very high juice yield, and the automatic pulp-ejection feature offers continuous juicing. 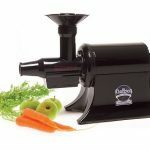 It can be used as a juicer, homogenizer, pasta extruder, food processor, and grinder. The product includes various cones and nozzles as attachments and accessories. The low speed helps guarantee that the healthy antioxidants and nutrients of the produce are retained. Less froth is produced, and there’s no foam which can cause oxidation. It’s also economical, as you need fewer amounts of fruits and vegetables to produce more juice. The juice can also be stored safely for three full days, without the juice separation or degradation which is a common occurrence in other products. This is a very versatile appliance. 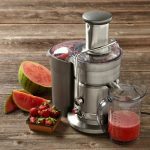 Besides producing juice from fruits and vegetables, it also acts as a food processor and extracts nutrients and flavors from seasonings and herbs. Baby food and other especially soft foods can also be prepared quickly. 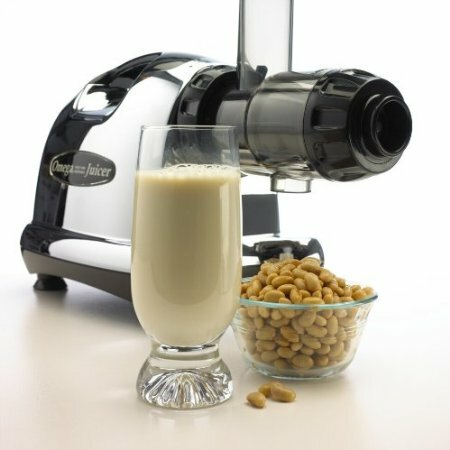 As a homogenizer, it can produce nut butter and fresh frozen desserts easily, and it can also grind flour and coffee beans. It can even extrude breadsticks, linguini and spaghetti with the use of the pasta nozzles. The design looks great, and it can greatly enhance the look of any kitchen. It’s quite easy to use, and cleaning doesn’t really entail much time or effort. The manufacturers offer a 10-year warranty, and some heavy juice users who needed their juicing screens replaced report awesome customer service, with a replacement for the screens sent for free. Due to the low rpm, the juicing process takes a little longer. But since you only need an extra two to three minutes to juice, and the juice retains most of its healthy nutrients, this delay is inconsequential. Some users may not be able to fully understand the user manual, which isn’t well-written at all. Fortunately, the design of the Omega J8005 is very intuitive, and users can easily figure out how to use it efficiently. 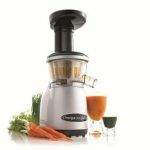 The Omega J8005 can do more things—and do them better—than other juicers, and at an unbelievably low price. It’s easy to use and clean, and the juices come out tastier and healthier. It’s a great buy, and a worthy addition to any kitchen. Apparently, the consumer market agrees with this assessment, as sales have been consistently high through the years. ==>Click here to get yours too<==.